Attend the Kick-off Meeting for zMOD: Fairfax County and its consultant, Clarion Associates, will hold a community meeting as part of the official kick-off for the next phase of the Zoning Ordinance Modernization project (zMOD) on Wednesday, January 24, at 7:00 p.m. in the Government Center (conference rooms 4 & 5). This phase of the project will include restructuring the format of the ordinance, and updating and "bucketing" land uses. For additional information, please see the project website (http://www.fairfaxcounty.gov/planning-zoning/zmod) and the news release (https://www.fairfaxcounty.gov/publicaffairs/attend-jan-24-community-meeting-launching-fairfax-countys-zoning-modernization-project). You may also contact the Zoning Administration Division at 703-324-1314. GFCA is working with a group of Great Falls residents to explore the feasibility of a ride service for our non-driving Seniors (55 years and older). This service would be staffed by volunteers and provide free rides for non-driving seniors to get to important appointments, for example medical, legal or banking. 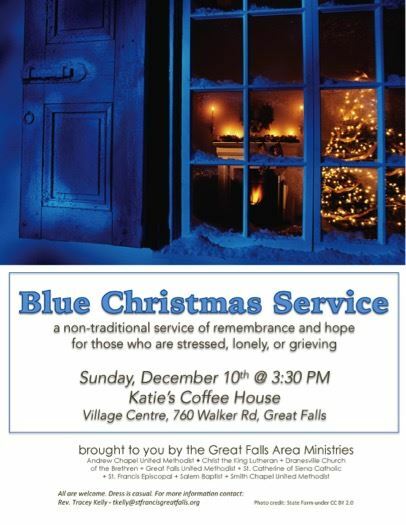 Many communities in our area provide this service today – but none serve Great Falls. We are conducting a survey to assess the viability of such a service – based on demand from non-driving Seniors and the interest among drivers to volunteer some time. A GFCA member survey will be distributed directly to members by email. We would appreciate a large response, even if to say “no interest”. Finally, questions can be directed to the feasibility team by email at SeniorRides@gfca.org. Do you have a college student home for the holidays, or high school student, or are you interested in a fun temporary opportunity? Attendees will be able to meet with hiring supervisors and find out how to apply for these and other federal government positions. 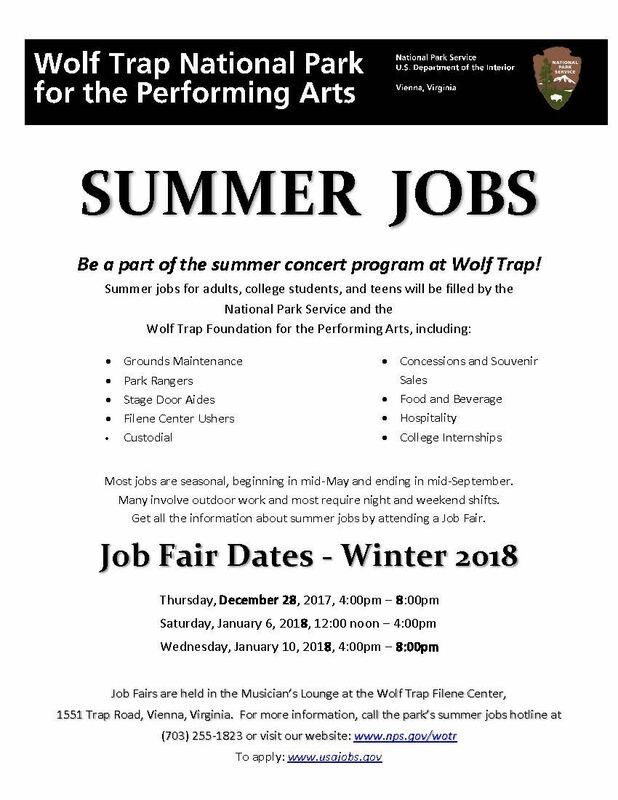 If you have questions – please call the National Park Service employment hotline at 703-255-1823 or visit www.nps.gov/wotr/learn/management/employment.htm. At our October TownHall yesterday, membership formally approved the Bylaws proposal recommended by the Executive Board. The Bylaws revision included technical corrections and a collection of other measures designed to improve GFCA operating effectiveness. Specifics of the revisions have been the subject of prior newsletters, and can also be viewed here. After a summary by Phil Pifer, and general Q&A discussion, the measure was approved unanimously by the members present. The public is invited to attend GFCA's November TownHall meeting on Tuesday, November 14 at 7:00 PM at Great Falls Library, 9830 Georgetown Pike. William Dunn, Virginia Department of Transportation (VDOT) Project Manager for the Route 7 Corridor Improvements Project, and other VDOT staff will be speaking on major changes begin planned. Almost 7 miles of Route 7 is slated for widening from Tysons to Reston Avenue. Construction is currently scheduled to begin in late 2018/early 2019 and last for about 6 years. While it is expected that planned improvements will increase capacity on Route 7, some Great Falls residents have expressed concern that traffic congestion on Georgetown Pike could increase during construction. GFCA has been discussing this and other issues with VDOT. As the last Design Public Hearing was in November 2016, the upcoming TownHall meeting is your opportunity to hear about changes to the plans that have made over the last year, the updated schedule, construction approach, and find out how the project may impact you and your neighborhood. Also at this TownHall, GFCA members will be asked to vote on proposed changes to the association's Bylaws. While only GFCA members may vote on the Bylaws, the public is encouraged to attend the meeting and participate in the Route 7 discussion. We look forward to seeing you! GFCA is recommending County funding for three important local projects in the current round of Transportation spending being decided this fall. At $100M county-wide, this round is small compared to prior years and there will be fierce competition among communities for their local projects. GFCA is asking for citizens' help by completing a short County survey in support of these recommended projects (see instructions below). GFCA has long believed that Great Falls does not receive a fair and equitable proportion of County funding for improvement projects relative to either our tax base or our population, compared to other communities. GFCA is asking for strong support from our citizens in order to reverse this situation. Intersection improvements at Georgetown Pike (GTP) and Walker Rd. Full funding ($400K) will allow safe pedestrian crossing in the center of Great Falls Village, and improve safety and the flow of vehicle traffic at this important intersection. [Project ID 466]. Trail along Utterback Store Road from Forestville Elementary to GTP. Full funding ($700K) will allow children to walk on a safe path from surrounding neighborhoods to the school, rather than being bussed. Fairfax County Public Schools had determined that walking and biking to schools improves children's health, mental well-being, and educational performance as well as reduces the expense and negatives of bussing. [Project ID 213]. Concept design work ($100K) on GTP trail from Utterback Store Road to Walker Road. Concept design work would determine the ideal route and most likely cost estimates for this very important trail segment, including north side or south side routing along GTP. This segment is the most important project toward our vision of an integrated trail system throughout Great Falls that will allow people on foot or bicycle to transit from their neighborhoods to other points in our community, and would complete a trail running from Seneca Road to Great Falls village. We do not believe that current county cost estimates for these projects are accurate. Concept design funding would allow an optimal high-level design concept to be determined and accurate construction cost estimates to be set. [Project IDs 616 and 618]. Project 466 is our highest priority project. It will allow pedestrians to safely cross our two busiest streets and transit on foot throughout our major commercial center (Great Falls Village) and thereby encourage residents to walk to stores, the library and the Grange, instead of driving to each destination. It will give students living south of Georgetown Pike the ability to walk to Great Falls Elementary. Walking to school has been determined by Fairfax County Public Schools to improve student health and academic performance, while also reducing bussing expenses for the County. This project will also improve sight lines for vehicles at the intersection, allowing southbound traffic on Walker to make a right turn on red safely at the intersection, improving the flow of traffic. Project 213 is an important project to link more neighborhoods to the current end of the Georgetown Pike Trail (at Utterback Store Road) that will soon run all the way to Seneca Road. The project will allow school children along and behind Utterback Store Road to safely walk to Forestville Elementary.. Projects 616 and 618 are essential to the completion of the Georgetown Pike Trail from Seneca Road to Walker Road and Great Falls Village. This trail is the backbone to a trail system that one day will allow Great Falls residents, who now must use a car to travel outside their neighborhoods, to transit on foot or bike to other parts of Great Falls. We believe the current Fairfax County DOT cost estimates for these projects are too high – making them appear quite costly, and as a result, making it extremely unlikely they will be constructed. We believe that expending a small amount on high-level initial/concept designs for these trail segments will answer questions about the optimal route and locations of the segments and allow a more accurate cost estimate to be developed. Thus, future funding considerations will be more fact-based. At total funding of $1.2M, the three projects above represent only 1.2% of the current funding round, whereas Great Fall's population is about 1.7% of county population and contributes an even greater proportion of residential tax revenues. We ask Great Falls residents to complete a brief County survey providing their opinions on transportation projects. It will only take a few minutes of your time. Please also encourage friends and family to take this survey (the more, the better!). Review the Transportation Priorities Plan list mentioned on the first page of the survey to read descriptions of the projects being considered countywide, if you wish. Hit "NEXT" to move from page to page through the survey. As you complete the survey, you will be able to enter two projects you want in each of the following categories: Transit, Interchanges, Spot Improvements, Road Widening, and Pedestrian. All of the Great Falls projects above are listed under the Pedestrian Category. None of the projects listed in the other categories are in Great Falls. Step through each of the categories, and check at most two projects per category for funding. If you do not have a preference in a category, check "None of these projects are a priority for me"
That's it! Thank you for your assistance. In June we told you about our initiative to revise and refresh our Bylaws, with the objective of making GFCA more effective and focused on our mission of “promoting all aspects of community interest accruing to a common good” as our Bylaws say, or “Keeping Great Falls Great” as we say more commonly. We are pleased to announce that the Executive Board in September approved revised Bylaws, and we will be asking the membership to vote to adopt them at our TownHall meeting in November. Establish “Policies and Procedures” to guide internal practices consistent with the Bylaws, which “operationalize” consistent best practices throughout GFCA in important areas. Make a number of changes to the way our committees operate: committee procedures, committee chairs and duties, applying conflict of interest rules that currently only apply to Board members, and committee membership. You can also review the initial draft of the Policies and Procedures Manual (PPM) by downloading it from the link above. The PPM lines up with the Bylaws, and provides amplification of the bylaws with policies and procedures designed to codify best practices and serve as guidelines for how the GFCA should function internally. This initial draft is only a start on what will be a somewhat longer PPM overtime, and in it, in addition to sections already written, are placeholders for additional sections yet to be written. One of GFCA’s major initiatives over the past 3 years has been development of plans for a comprehensive trails system to connect the Great Falls community – allowing residents to transit and recreate on foot or by bike from their neighborhoods to other points of interest in Great Falls such as the Village, schools, and parks. Recent projects beginning to fill out the Georgetown Pike trail between the Village and Seneca Rd are a direct result of this effort. But these are just the beginning stages of what will be many years of work to complete and require a consistent Vision pursued with persistence and diligence in funding and construction. Another important foundation has just been set: on Sep 19 the GFCA Executive Board formally adopted a set of policies called: “GFCA Guidelines for Trail Design and Construction in Great Falls”. This is the result of 18 months of exploration into the reasons why Great Falls trail development has failed in the past both overall and at the trail project level. In addition to work of our task force, we worked with other local organizations, most notably Trailblazers, as well as County staff, on the development and specific conclusions. Ensure that trails built in the future will be functional, durable, and support the needs of the community for decades. The Guidelines are available here. Our trails team is already hard at work with the county and other authorities on their implementation. The next phases of the Georgetown Pike Trail (Phases III and IV, mentioned in another article) have been designed consistent with these guidelines. In continuing efforts to build an interconnected trail system in Great Falls allowing people to leave their neighborhoods on foot or bike, GFCA encourages citizens to attend a community meeting on the next phase to be constructed, called "Georgetown Pike Phase IV." This meeting will be held on Oct 4, 7 p.m. at the Great Falls Library. The Fairfax County Department of Transportation (FCDOT) is holding a community meeting concerning the Georgetown Pike Trail Phase IV project, which will complete a 1200' long section of trail between Falls Bridge Lane and Seneca Road. County Staff will discuss design elements of the trail and answer questions. This is a follow-up to a meeting that was held on March 22, 2017 which focused on Phase III of the trail and the preliminary designs for Phase IV. The public is invited to comment on the project online; by writing to FCDOT at 4050 Legato Road, Suite 400, Fairfax, VA 22033; or by calling 703-877-5600. Comments are due by Friday, October 27, 2017. Please feel free to share this information with your friends and neighbors.